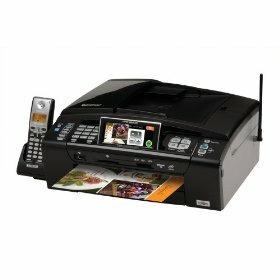 The MFC-990cw is a feature packed wireless all-in-one printer, copier, scanner and fax. Using the 4.2" color TouchScreen display, it is easy to preview faxes, enhance and edit photos, and view help menus. Photos can also be printed directly from most Bluetooth wireless technology enabled hand held devices. This model includes a digital answering machine with full duplex speakerphone and 5.8GHz digital cordless handset. 4.2 TouchScreen Color LCD Display. Easily navigate through the menu by selecting items on screen. Plus, preview faxes, preview/enhance/edit photos and view help menus. Bluetooth Wireless Technology. Easily print JPG photos from most Bluetooth wireless technology enabled handheld devices.